Manfred Hader co-heads Roland Berger GmbH’s Global Aerospace & Defense Practice, operating out of the firm’s Hamburg office. As a senior partner at Roland Berger, where he has worked for 21 years, Hader advises top management of large international companies and institutions in strategic development and transformation. In mid-November of last year, Hader travelled to Ottawa to present a preview of The Aerospace & Defense Top Management Issues Radar 2018 (A&D Issues Radar) at the Canadian Aerospace Summit (CAS). By mid-December the final A&D Issues Radar was released outlining what Roland Berger’s team views as the most critical disruptive forces to the future of the global aerospace supply chain. The report, based on polling the opinions of more than 200 industry insiders from 90 companies in 15 countries, kicks off with The Big 3 statistics: More than 50 per cent of respondents believe the civil cycle has five or more years to run; 92 per cent believe the aerospace workshare model of who does what in the value chain is being disrupted; and 85 per cent expect further consolidation among Tier-1 suppliers, particularly in aerostructures. 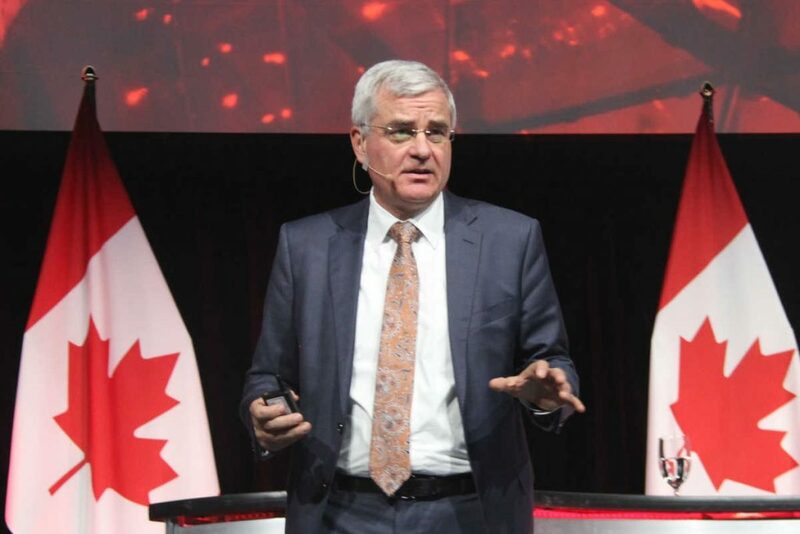 Hader during CAS, organized by the Aerospace Industries Association of Canada, discussed key drivers of these statistics in more detail framed within a keynote called Navigating the Skies in Times of Disruption. He points out that order books are full in the A&D sector with a backlog of more than 5,500 airplanes, which will take another six and a half years to clear. This largely speaks to a positive outlook by the respondents, but the survey shows companies are also faced with a huge variety of issues centered around disruption putting strategic preparations at the forefront of their business needs. Roland Berger’s team cuts through the clutter of concerns in the A&D Issues Radar to outline the five key disruptive forces for the future of the aerospace value supply chain, including: Insourcing by OEMs, consolidation amongst suppliers, emergence of local supply chains, digitization, and electric propulsion. Hader believes nobody is safe from the disruption of OEMs moving work in-house, even if it most notably affects the position of Tier-1 suppliers. Boeing has driven this trend for the past five years, explains Harder, but the report finds the pace accelerated over the past two years and now Airbus has also adopted the strategy. The A&D Issues Radar notes consolidation is rife on the supplier level, turning supply chains upside down, particularly as mammoth players – Collins Aerospace, for example, after UTC’s November acquisition of Rockwell Collins created a $52 billion giant (2017 pro forma revenue) – become indispensable. “Consolidation is going to [continue] and the next segment is likely to be aerostructures for a very simple reason. If you look at the market structure of aerostructures, some top 20 players have around 80 percent of the market which on average means [about] four per cent per player,” says Hader. “So this market is still highly fragmented. At the same time, OEMs are asking these poor aerostructure players for efficiency, efficiency, efficiency. They are at the centre of what we would call revolution in aerospace.” Hader continues to explain how this puts enormous pressure on aerostructure firms to invest in automation and new materials, which can truly only be managed by having more scale. Another growing trend in the industry is the emergence of local supply chains, which Roland Berger also labels as internationalization, with some 30 per cent of its survey respondents expecting a shift of production capacities to new countries. “Participants say – yes – there will be local supply chains built up in emerging markets which essentially means the classical export model for Western countries and Western companies is dead,” says Hader. The report predicts this focus will be on Asia, especially China, India, the Middle East and Turkey, as well as North African states such as Morocco and Tunisia. Hader points to India and Saudi Arabia as two prime examples of countries that have launched comprehensive policies to stimulate local aerospace supply chains. He explains India wants to transform itself into a global design and manufacturing hub, with manufacturing making up 25 per cent of its GDP by 2020, which means encouraging partnerships with local companies. Hader notes the country needs to create 10 million new jobs every year just to sustain or manage its population growth. As a big arms importer, India also committed to a goal of having 50 per cent of its military equipment budget spent domestically by 2030 – starting basically from zero today. Digital transformation was voted the second highest priority in the A&D Issues Radar, after only being introduced to our survey two years ago. Hader explains that OEMs, engine manufacturers and MRO providers have all launched new service offerings utilizing Big Data for predictive maintenance and condition monitoring. From the Roland Berger survey, 65 per cent of respondents state that they are working on new product/technology offerings, which is up from just 20 per cent in the 2017 survey, while more than 50 per cent are working on new service offerings/business models (40 per cent in 2017). Similarly significant jumps in electronic propulsion indicate this segment of the industry, often referred to as the third revolution in aviation, is beginning to disrupt the aerospace value supply chain. The number of announced electrical propulsion development programs has risen from 44 in 2016 to 85 in 2017 and to 130 in just the first nine months of 2018.